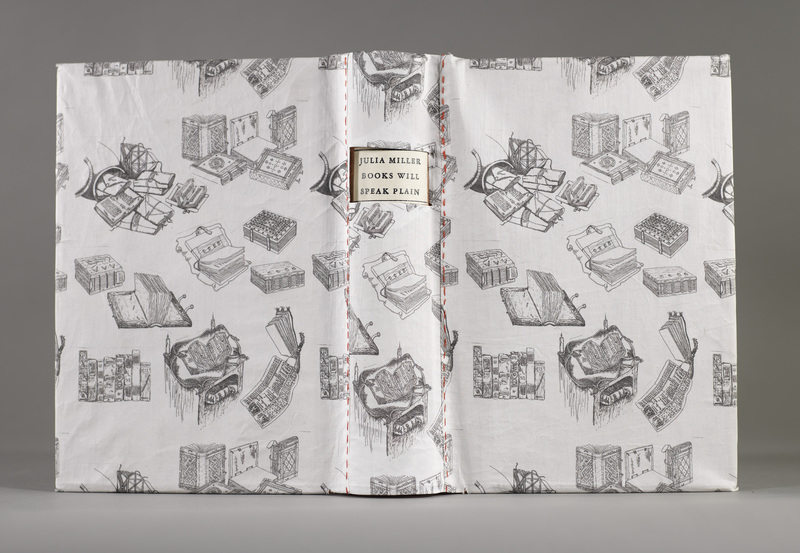 German case binding covered with handmade paste paper, sewn on three cords with added flyleaves at the front and back, two-color linen endbands, edges trimmed at the top and bottom, fore-edge opened, but not trimmed, overcover made with fabric designed with drawings from the text. The binding is intended to evoke a sense of history. The design and materials construct a story of the book: remnants of a blue paper wrapper present on its outer leaves as if from an earlier binding, a later German case binding, and a 19th century North American style overcover. Congress Rare Book Conservation Office, and received an M.S. in Library Service and a Certificate in Library and Archives Conservation.